THE BIG BANG THEORY. Offical Trading Card 3-Ring Binder. Binder In Unused Pre-Owned Condition As Shown In Photos. Seasons 3 & 4. For sale is the Trading Card pictured and listed in the title. I have included a high quality scan of the front and rear of the card. I have included a high quality scan of the front and rear of the card. For sale is the Trading Card pictured and listed in the title. These cards appears to be excellent or better condition. All cards are graded as a matter of personal - yet fair - opinion. BIG BANG THEORY SEASON 1 & 2. THE CARD IN THE PICTURE & TITLE IS THE CARD YOU WILL RECEIVE. THE CARD IS IN M/NM CONDITION. I have included a high quality scan of the front and rear of the card. For sale is the Trading Card pictured and listed in the title. The pictures are of the actual card you will receive. AARTI MANN AS PRIYA KOOTHRAPPALI A8 AUTO CARD. BIG BANG THEORY SEASON 3 & 4. THE CARD IS IN M/NM CONDITION. ULTRA RARE SIMON HELBERG AS HOWARD WOLOWITZ A4 AUTO CARD. 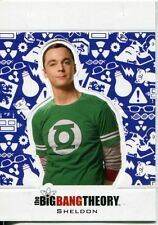 BIG BANG THEORY SEASON 1 & 2. THE CARD IS IN M/NM CONDITION. BIG BANG THEORY SEASON 3 & 4. THE CARD IS IN M/NM CONDITION. THE BIG BANG THEORY SEASONS 6 & 7 - PDL2 PASHA D. LYCHNIKOFF (DIMITRI REZINOV) AUTOGRAPH CARD. The card shown in the photograph is an example of the actual card you would receive. The signature may vary slightly. MBA2 Horizontal Autograph Card. BIG BANG THEORY SEASONS 6&7. The card is in Mint / Near Mint condition. We also buy trading card collections. Christine Baranski as "Dr Beverly Hofstadter". CB1 Vertical Autograph Card. BIG BANG THEORY SEASONS 6&7. The card is in Mint / Near Mint condition. We also buy trading card collections. The card shown in the photograph is of the actual card you would receive. 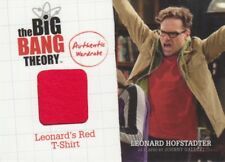 M14 RED VARIANT "Sheldon" Wardrobe Card. BIG BANG THEORY SEASON 5. The card is in M/NM condition. We also buy trading card collections. M-02 - "Leonard's Boxers". BIG BANG THEORY SEASONS 3&4. Wardrobe Card. The card is in M/NM condition. We also buy trading card collections. A9 - Becky O'Donohue as "Siri. BIG BANG THEORY SEASON 5. Autograph Card. The card is in Mint / Near Mint condition. We also buy trading card collections. A10 - Brent Spiner as himself. BIG BANG THEORY SEASON 5. Autograph Card. The card is in M/NM condition. We also buy trading card collections.